In its nearly 1,700 years, the Byzantine church Hagia Sophia in Istanbul has been harbouring many exciting mysteries, which today are brought to light one by one. According to the Bulgarian News Agency, a team of Turkish divers and speleologists uncovered some of the underground secrets, kept by the church during the ages. The team's findings, which are featured in a 50-minute documentary, throw light on some of the mysteries buried beneath, while at the same time dispel some of the myths. The team went down 283 metres and filmed two underground stone-tiled passages. According to one theory, the Byzantine emperor Theodosius II used one of the passages when he wanted to sneak unnoticed to the Hippodrome. The Hippodrome was an arena where races and gladiator fights were held, which is why some call it Istanbul's Colosseum. In the floor right under the magnificent dome of Hagia Sophia lies the cover of the main water reservoir, which is 12 m deep. The team has found two rooms of 5 sq m each, containing bones and fragments from drinking vessels. The remains are believed to be of Saint Antigenos, a child saint, who is the only human being buried in Hagia Sophia up until the 13th century and of Patriarch Athanasius, who died in the 15th century and was buried in the church. The two rooms are most likely burial chambers. Meanwhile, Turkish media report that three more mosaics of angels will soon be uncovered. Turkey's Culture and Tourism Minister Ertuğrul Güna was commenting on the recent discovery of a mosaic depicting an angel in the church. “For the first time in my life, I am a part of an endeavor this exciting,” Günay said at a press conference he held at Hagia Sophia, where he added that three more similar mosaics will be uncovered in the future. “This endeavor made at the northeast quarter of the dome is a very important one for Hagia Sophia and, I believe, for Christian theology,” Günay added. The angel mosaic’s true age will be assessed after an analysis by the Hagia Sofia Science Board compares it to similar mosaics. Its six-winged figure depicts the seraphim, an angel described in the biblical book of Isaiah. The minister said he hopes to learn all about Hagia Sophia, preserve the important building and promote it to the world. 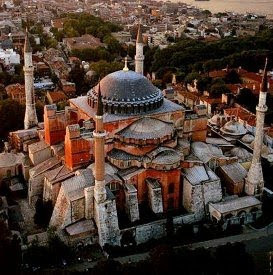 Present day Hagia Sophia was built by Byzantine Emperor Justinian in 532-537. But even earlier, during the time of Emperor Constanine the Great a church stood on the site. For over 900 years Hagia Sophia was the main church of the Christian world and Turkey's principal mosque for over four centuries. Today, the church, which features on the UNESCO World Heritage List, attracts over 2 million visitors every year. With unprecedented access to underground tunnels and reservoirs that permeate the earth around Hagia Sophia, filmmaker Göksel Gülensoy sets out to discover their histories in his new documentary. In the film he explores spaces untouched by man for centuries. ‘I believe what is beneath Hagia Sophia is much more exciting than what is above the surface,’ Gülensoy says. Chasing 1,700-year-old secrets hidden beneath Hagia Sophia is no easy feat, but documentary filmmaker Göksel Gülensoy has navigated the labyrinths, ancient and bureaucratic, and will soon release his cinematic chronicle of the subterranean adventure. 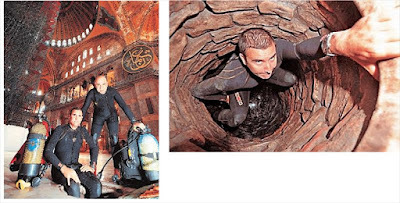 Gülensoy’s team of two divers and four spelunkers searched the reservoirs connecting the famous Byzantine building to Topkapı Palace and the Yerebatan Cisterns. The spelunkers tried to find the secret passages said to extend from Tekfur Palace, next to the old city walls, to the islands of the Marmara Sea. Although Gülensoy started shooting his documentary back in 1998, he finished work on it only recently due to obstacles with the budget, official permissions and restoration work on the Hagia Sophia museum. His 50-minute documentary, “Ayasofya’nın Derinliklerinde” (In the Depths of Hagia Sophia), will compete at international festivals starting in the fall. On the floor of the main hall under the gigantic dome, the reservoir door close to the entrance was opened first. Judging by the concrete around it, it had not been used for a long time. According to records about the building, it had been decided in 1945 to empty the water under the floor for research purposes, but that attempt failed when the water level did not go down. The idea was given up all together after the pump’s motor burned out. Thus, the doors were opened for the first time in 64 years, and for the first time in history, a diver was going underneath Hagia Sophia. It was 9:30 on a December morning and the water temperature was 6 degrees Celsius. Cameraman Engin Aydın and photographer Ozan Çokdeğer were the first to go down into the reservoir. During the exploratory work done the week before, they had lowered a camera down and saw passages below the building. As the entrance was too narrow to accommodate the oxygen tanks of the divers, a 50-meter-long hose was prepared so they could breathe in case the passages extended to the depth of the building. The reservoir under the first door was 12 meters deep. Near the bottom, Çokdeğer saw two thick pieces of wood, resembling shovel handles, in what looked like fine condition. They turned into dust when he touched them. Then he saw a bucket, which also broke to pieces when he touched it, and an animal’s skeleton. Çokdeğer studied the walls of the reservoir for 50 minutes, and then returned to the surface. The research team had permission to work for only a day, so they rapidly moved to the second shutter, closer to the center of the dome. Years ago, Erdem Yücer, one of the former directors of the museum, had shown Gülensoy a photograph that was taken of the foundations of Hagia Sophia. The photo showed researchers in a boat in a place filled with water, resembling the Yerebatan Cisterns. Seismic research had also demonstrated that the area underneath the big hall was empty. The team, which had previously lowered a camera down from the second door during the first exploration, was thrilled to see two passages extending to the center of the building and to the exit door – passages that might extend to Yerebatan and Topkapı. Diving supervisor Levent Karataş and diver Kenan Ergüç lowered the cameraman and the photographer with a rope down to the bottom of the second reservoir. The floor was covered with ooze up to their knees. The first things Çokdeğer noticed were around a dozen flasks dated 1917. British soldiers likely dropped them while trying to get some of the holy water during the invasion that year. Next they found glass from the giant chandeliers that used to light up Hagia Sophia. A further search led to a chain with two rings at the end. Perhaps a prisoner met his death there. Chilled by the thought, Çokdeğer next found what looked like pieces of stained glass in seven colors. He sent some of the pieces up for better examination; later, they were returned to the water. The two divers were in the reservoir for 50 minutes and left after they finished recording the sealed passages inside the stone walls. They went straight to the mobile x-ray machine, where Ministry of Health personnel confirmed that the divers had no foreign objects on their bodies. Permission for exploration had been granted on the condition that everything found was to be left in its original place and that no changes to the structure of the building were to be made. That is why the sealed passages were left untouched. The research and recording work in the tunnels beneath Hagia Sophia’s main hall was undertaken by the International Speleological Society of Boğaziçi, or BUMAD. Four experienced spelunkers with professional cameras on their helmets had eight hours to explore as deeply as they could. First, a team from the Istanbul Gas Distribution Industry and Trade Joint Stock Company, or IGDAS, checked the entrance of the passage for poisonous gases and decided there was no threat. Just in case, the team of four was still equipped with gas detectors. Assoc. Prof. Haluk Dursun, the director of the Hagia Sophia Museum, joined the spelunkers this time. The hall they first stepped into was long, like a corridor, and strengthened with pillars. Two stone tunnels of approximately 70 centimeters in height extended in the direction of Sultanahmet Square and Topkapı Palace – presumably the tunnels the mighty 5th-century Byzantine Emperor Theodosius II had used to go to Tekfur Palace and the hippodrome without being seen by the public. The spelunkers split into two teams and entered the tunnels in opposite directions. Both of the tunnels were strengthened with brick arches and split into two after 50 meters. One branch of each tunnel led to a spot under the dome, but those passages were closed. Yaman Özakın and Emrah Çoraman took measurements with a laser and drew a sketch while Pelin Kurt and Aydın Menderes continued to move in the direction of Topkapı Palace. After a while, Menderes resumed his journey, starting to crawl as the tunnel height decreased to 25 centimeters. When he saw daylight between the stones in front of him, he used his pen camera and saw he had reached the palace yard. Menderes returned the way he had come and entered another tunnel to discover two rooms approximately two meters high and five square meters in size. Bones and broken jugs were scattered around. This place, it seemed, was likely the gravesite of St. Antinegos, the first person to be buried in Hagia Sophia, in the 13th century, and Patriarch Athanasius, who was interred 200 years later. It was the most exciting discovery of the day. “My friend Assoc. Prof. İhsan Tunay, a student of Semavi Eyice, took me on a tour of Hagia Sophia in 1990 and told me legends about the structure. Thanks to him, I became passionately devoted to the building,” said Gülensoy. The director believes those findings should be examined from an archeological perspective and that Hagia Sophia should be closed for a while so the building can be extensively scanned. “All restorers in Turkey should gather and quickly restore the mosaics and other parts,” he said, adding that there should be a “Classical Istanbul” or “Eastern Roman Civilization” museum in the city where the findings could be displayed.